A pacemaker is a small sized device that is placed in your chest. It helps your heart beat regularly and prevents your heart rate from going to slow. 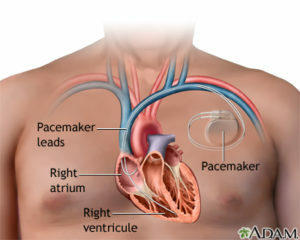 The pacemaker is made of two parts: a generator and the wire leads. The generator is a battery that goes under the skin. It is connected to tiny wire leads that go into the chambers of your heart. These leads have electrodes on the end that stimulate your heart to beat when your heart rate is too slow. The number of leads needed will be determined by your physician. You will arrive at Boone Hospital Cath Lab for the procedure. You will be asked to wear a hospital gown and remove your jewelry. An IV with be started and blood will be drawn. You will give a urine sample to make sure you do not have any urinary infections. Your doctor will review the risks and benefits of the procedure and you will be asked to sign a consent form. Once it is time for the procedure you will be taken into the procedure room. You will be connected to an electrocardiogram (ECG) that records your heart rhythm. Your vital signs will be monitored throughout the procedure. An IV antibiotic will be given to prevent infection. Your skin will be cleaned with an antimicrobial. The nurse will give you some medication that will help you relax. You may feel groggy; however, you will be awake during the procedure. Once the procedure starts you will be given a local anesthetic to numb the skin. A small incision will be made below the collar bone. The doctor will place the pacemaker leads into the appropriate chambers of your heart. The device will be placed under your skin. The incision will be closed with suture. These sutures will absorb over a period of time and will not have to be removed. Following the procedure, you will stay overnight for monitoring. Once you are completely awake you may eat and drink. You will be on bedrest for a period of time which will be determined by your physician. Your incision may be sore. You doctor will discuss how to best manage your pain, including medication options. Most patients are discharged home the following day with a list of activity restrictions and incisional care. You will also be given a transmitter box to connect at home. This allows the Missouri Heart Center to monitor your defibrillator wirelessly. You will be given a card with your pacemaker information and you should keep this in your wallet or somewhere safe. How long does this surgery typically take? It typically take approximately two to three hours to complete the pacemaker implant surgery. Are there any risks associated with the surgery? You could also experience swelling, bruising, or bleeding at the generator site.